This is part of a continuing series that will hopefully put to rest any questions that the vision of Teilhard de Chardin is not a part of mainstream Catholic, Christian theology. In Part I through Part V (you can see a summary and links to these parts at the end of this blogpost) of our series on the orthodoxy of Teilhard de Chardin, we discussed how Teilhard’s ideas have been incorporated into mainstream theology using the writings of Pope Emeritus Benedict XVI. “Teilhard’s work nevertheless provides an occasion to develop more intensively a whole dimension – the cosmic dimension of Catholicism – in de Lubac’s thought. Teilhard is a visionary; he is a scientist; but not least is he a great and conscious apologist who was concerned, as was de Lubac, to reflect upon creation on as noble a scale as possible – and thus upon the Creator. His ambition was to propose a ‘mysticism of the West’ as an alternative to the apersonal-atheistic mysticism of the East and to modern Western atheism. A mysticism that would be personal down to its very roots. The incarnation of God in Jesus Christ occupies the central position in the world. Both the inner-historical and the eschatological nature of this position let the entire world genesis converge upon Christ, in an ascending movement from matter to life to personal spirit. In the genesis of spirit the movement is at the same time realization (of what was potential). ‘Christ is more real than every other reality in the world‘ says Teilhard. . .
God’s plan of creation completes the edifice that has been begun by Christ, who is the keystone and who integrates into his mystical or eucharistic body all persons (who let themselves be inserted into his universal person). The world is ‘thus held together ultimately only from above.’ Evolution, as coherent, only becomes possible through what comes last, the omega of evolution. It is the final synthesis that explains everything, and Teilhard attempts to build up his ‘proof of God’ by starting here . . . The entire universe attains its real, substantial footing ultimately only in the person of the God-man.” (emphasis added). In Part II, Pope Emeritus Benedict discussed statements made by St. Paul and Teilhard of the cosmos being a living host. In Part III, we started to discuss the concept of the role of the Cosmic Christ (the pre-existent logos who is the second person of the Trinity) in the creation of the cosmos. In Part IV, we continued the discussion of the ontological evolution of humanity, we discussed how Pope Emeritus Benedict discussed the evolution of humanity from mere matter to spiritual consciousness. In Part V, we continued Pope Emeritus Benedict’s discussion on the evolution of humanity in the Christian context towards the Omega Point, or the Cosmic Christ. 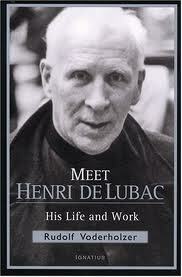 This entry was posted in Orthodoxy of Teilhard de Chardin and tagged Henri de Lubac, teilhard de chardin. Bookmark the permalink. He knew that this is because Christ is in authority of all space-time.